Let me cut to the chase: I love the Acer Chromebook 14. It has everything you would expect in a Chromebook and more. The display is excellent, it is responsive and fast, able to handle multiple tasks at once and has a battery life that is nothing short of phenomenal. Add to that a terrific webcam, a slim, all aluminum chassis that makes this Chromebook look way more expensive than it is, you have the complete package. I’ve had the opportunity to review several Chromebooks over the past few years and I have to say this one is my favorite to date. If there is one mid-range Chromebook that exemplifies how far the platform has come, it could well be the Acer Chromebook 14. This comfortably priced $286 Chromebook has all of the features you expect from a device running Chrome OS but it has something that so many others lack: Style and panache. The all aluminum chassis is beautiful, the Full HD display is easy on the eyes and it has the performance to keep up with your day-to-day tasks. But the added bonus of this particular Chromebook is that it has the ability to run Android apps and it can do it on the main production line of Chrome OS (the Stable channel). That makes it one of the best all around Chromebooks out there. I recently picked up the Acer Chromebook 14 and after using it for several weeks, it is hands down the best Chromebook I’ve used to date. My reliable and fantastic HP Chromebook 11 G4 has been replaced and without giving away the entire review, I have no hesitation in recommending this offering from Acer. It is just phenomenal to use day in and day out. Here is my review. quad-core processor running at 1.6GHz with bursting up to 2.24GHz. It is coupled with the integrated Intel HD Graphics 400 chipset. Again, not super special as the N3160 powers a lot of Chromebooks out in the market today. Coupled with the processor is 4GB of LPDDR3 RAM along with 32GB of onboard storage. Display wise, the 14′ LCD panel renders Full HD (1920 x 1080) graphics with solid brightness and color accuracy. I’ll cover the display in more detail later in the review. 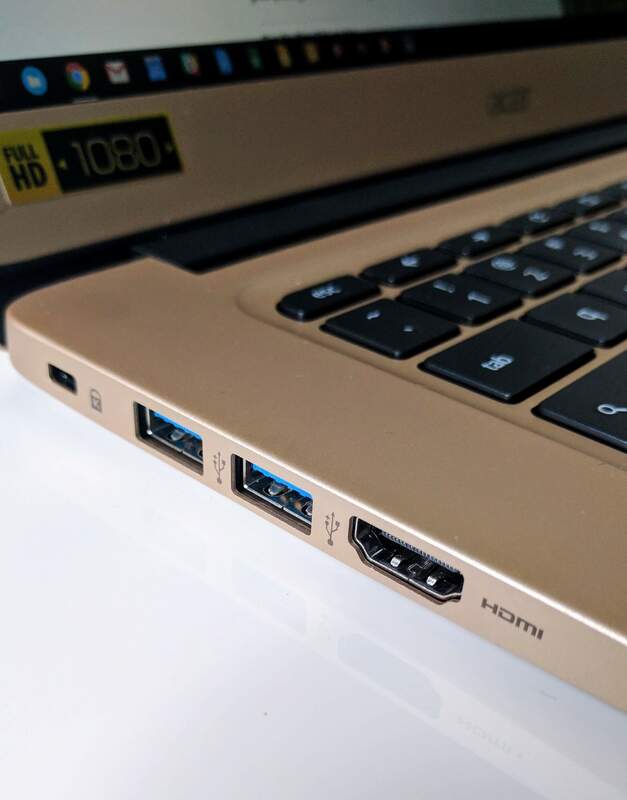 Port wise, the Chromebook 14 as two USB 3.0 ports, and HDMI port and a headphone jack in addition to the connector for the AC adapter. These are pretty standard for a contemporary Chromebook but note that it does not have a SD Reader. For some this will be a big deal while others will just use a USB key for external storage. If an SD Reader is a big deal to you, be aware that you won’t have one on this Chromebook. Connectivity is a solid Intel powered dual-band MIMO 802.11ac chipset for Wi-Fi connectivity and Bluetooth 4.0. The Wi-Fi performance of the Chromebook 14 is outstanding which I will cover in more detail later. Camera wise, there is a built-in webcam that support HDR so conferencing, especially with Hangouts, is excellent. fits easily in a backpack or bag. The biggest feature of from a design perspective is the all aluminum chassis. It gives this Chromebook a solid feel but also a more upscale look that the injection-molded Chromebooks that are everywhere. This looks professional and stylish. 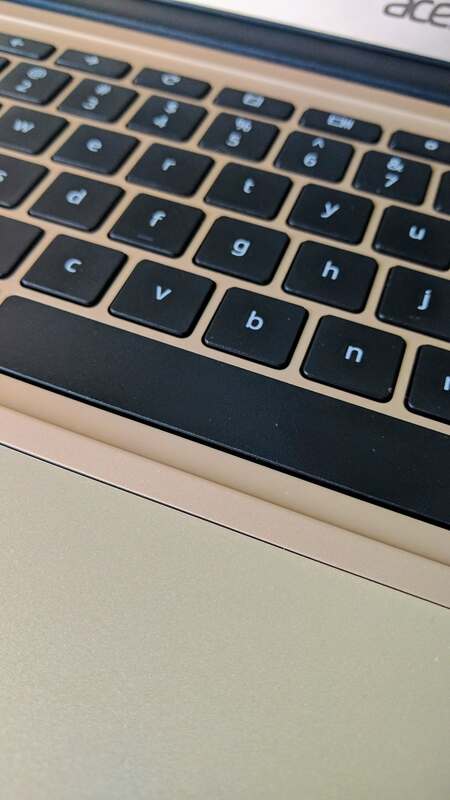 In my case, I picked up the gold tinted version of the Chromebook which adds a bit of flare. The chassis itself is tapered much like that of a MacBook Air. In fact, at first glance, it would be quite easy to confuse the two as they look strikingly similar. The hinge that connects the display to the base is a smooth and secure so you can have the lid open at various angles without having to worry about it slamming shut. It is very similar to the hinge you would find on a MacBook to give you a flavor for it. 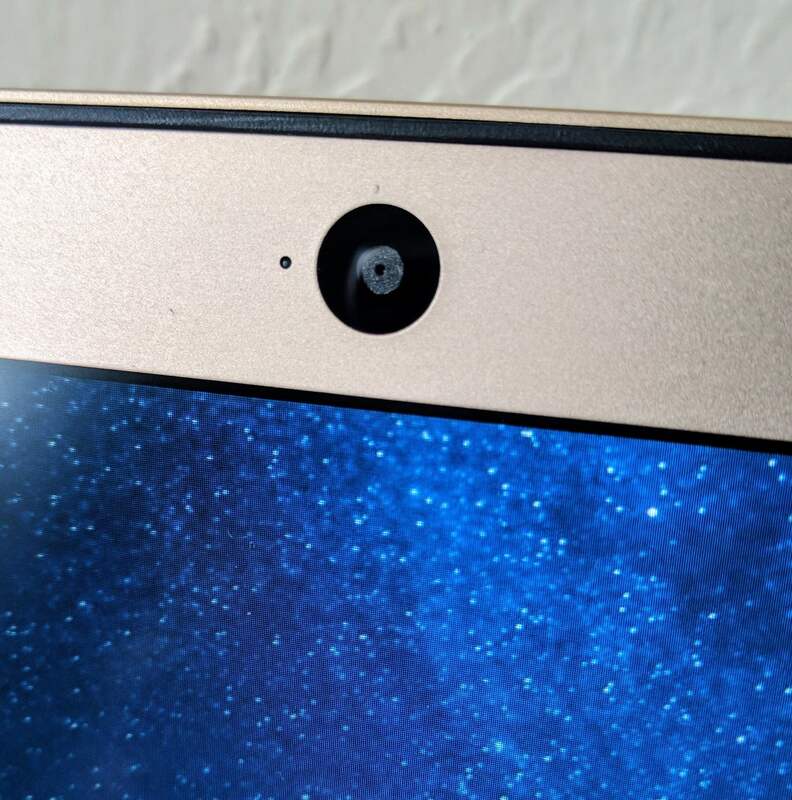 The display has roughly a 1/2 bezel on each side with the HDR-supporting webcam in the center at the top of the display. Like so many other elements of this Chromebook, the hinge/display assembly feels and looks premium. The Chromebook 14 has no troubles at all keeping up with daily tasks and use. Because of the improvements in the Intel N3160 processor, keeping multiple tabs open within Chrome or running Chrome OS apps doesn’t cause lag in usage. On average, I have 10 tabs open in Chrome and I never felt that the Chromebook 14 suffered from lack of processing power or RAM. I will contend, however, that a lot of this is helped by having 4GB of RAM installed. I highly recommend any Chromebook you are considering to have 4GB of RAM. Like PCs and Macs, it does make a difference, particularly if you have multiple tabs open all the time. Analytically, the single core Octane test pegged the Chromebook 14 at a score 9160, about average for this particular processor/RAM combination. That said, if you are using a Chromebook even two years old, this one will feel faster because of the improvements in the processor, RAM and internals of a modern Chromebook. The keyboard of the Chromebook 14 has a 1.4mm stroke which is comfortable and responsive. It is a full size keyboard so you will have natural hand position on it with the large trackpad below it in the center. The trackpad is also responsive and large so moving around your screen with it is quick and easy. The display of the Chromebook 14 is solid but not perfect. First, it is bright and evenly lit. The Full HD resolution is easy on the eyes for long periods of time and watching streaming content is a pleasure on this device. It also has a nice range of view from different angles. Color accuracy is very good as is the ability for the display to recreate colors (Color Gamut). Overall it is an easy display to use and view for long periods of time no matter the content. The display has a matte finish to cut down on glare which also helps in long time viewing or viewing in low light situations. If there is one complaint I have about the display is that it is was a touch brighter. On the brightness scale (measured in Nits), this Chromebook measured 215 while the average for all Chromebooks is around 245. So it isn’t as bright as others but, by the same token, it isn’t horrible. It would be nice to have a bit more brightness but for me at least, this isn’t a deal breaker. As I write this review, I am assuming the audience has an understanding of Chrome OS and thus won’t be going into great detail on the ins and out of how it works. If you are not familiar with it, I recommend doing some research on the platform prior to purchasing this or any Chromebook. In a nutshell, Chrome OS is a Linux kernel based Operating System that has the Chrome browser as its primary user interface. While it is aimed at being an online OS, it can be used in offline mode as well to access files. For those who are interested, I reviewed the Acer Chromebook 14 predominantly in the Stable channel. That build was version 55.0.2883.105 Platform 8872.76.0. During my review period, I did move the Chromebook 14 to the developer channel of Chrome OS and tested Android apps. Because it is not in the generally available Stable channel, I won’t comment much on it other than to say the apps I tested (Google Docs, Sheets, Slides, Evernote) all ran well and were stable. Another outstanding feature of the Acer Chromebook 14 is the battery life. It comes equipped with a 3920 mAh three-cell Lithium-Ion battery. Acer claims that you can get 12 hours of battery life out of it and they aren’t far off. In my battery test of scripted continual web browsing with full brightness of the display, I got 10 hours and 48 minutes of surfing time before it died. I will take that all day long because it will last me all day long. I can easily make it through a day on this Chromebook and not have to think about the battery life or go try to find an AC outlet to recharge. Given that I have been coming from the HP Chromebook 11 G4 as my primary Chromebook, this is leaps ahead of that model. On the HP, I was lucky if I got 7 hours. To be fair, it’s not perfect. I’d like to see a bit more brightness in the display and there have been a few times I wished the keystroke was a bit deeper on the keyboard. But neither of this would detour me from recommending it. 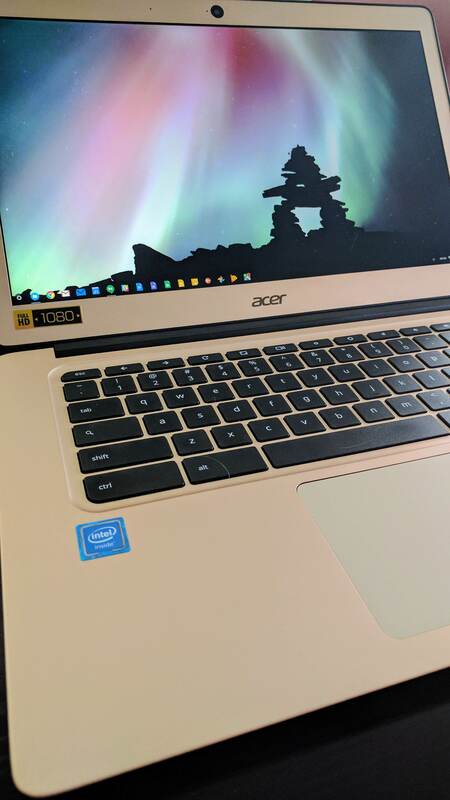 At the time of this article, the Acer Chromebook 14 was available for $286 from Amazon in either the brushed aluminum or gold aluminum finish. USB SD card readers are dirt cheap, usually read several types and there are probably few who don’t own at least one. No problem.